Why aren't my slides recorded? Who can watch the replay? When does the recording start and end? We record the first two hours of all of your sessions. The recording will start when you click on "Start webinar" and will end when you click on "End webinar." Can we start the recording at a different time? How long does it take to get the replay? Your replay will be available after each webinar. Once you click on "End webinar" it will be compiled and automatically available after max 1 minute. How do attendees access the replay? The replay is located inside the webinar room. Attendees can access the replay by clicking on their access link from the confirmation/reminder emails or the access link in the post-webinar emails. The access links are unique to each registrant. Can I download the replay? Share it elsewhere? What format is it in? Yes, you will be able to download the file in the "Recordings" tab in your dashboard. They are in MP4 format. You can embed your video into other websites as you wish. You may also share the link to your replay with non-registrants - this is a public link that you can share anywhere you'd like. What resolution are the sessions recorded in? However, you must know that the video quality will always be impacted by your average upload connection (if you can't properly upload an HD stream, you won't get an HD stream). If you are screen sharing, you can zoom in your application or web browser to maximize the quality. But the best way to have an HD replay is to record locally using a third party software such as Screenflow or use a Virtual Webcam software like ManyCam or XSplit . If you'd like to include your slides in the replay, you can always use screen sharing -> " How to share a presentation on Livestorm ?" 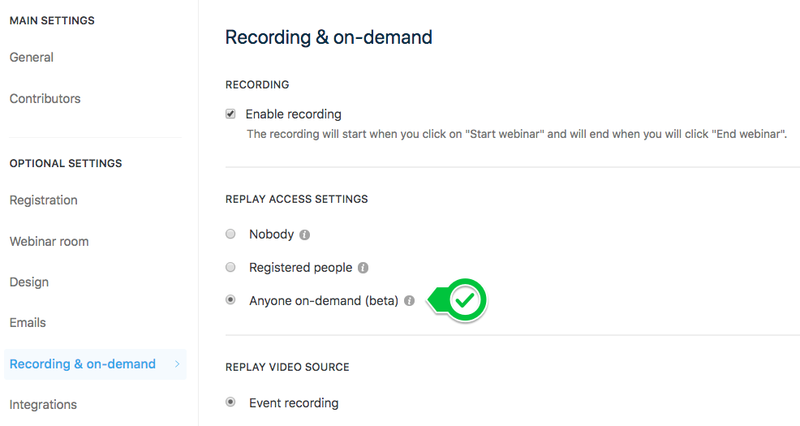 The replay is available inside the webinar room after you end the webinar — unless you have disabled the recording in your webinar settings or asked us to remove it from our database. You can also download it in your webinar dashboard, under "replay" once the webinar is over. Replays are only available for participants that have at least registered for the webinar. Registrants who did not join the webinar will still receive a link to access the room and watch the replay. You can choose whom you'd like to give access to, from your webinar settings. The recording privacy will be set to " Registered people" by default. 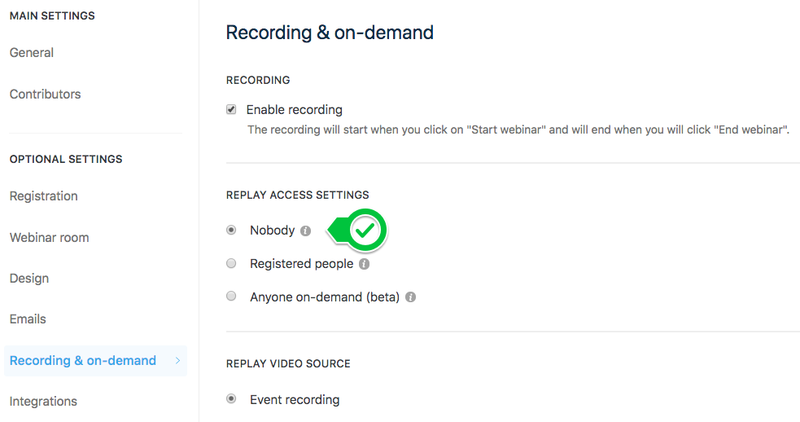 However, if you'd like to keep your replay private, you can choose "Nobody" in your access settings.This way, nobody will be able to watch the replay once you end your webinar. The CTA button in the post-webinar emails with the replay link will also be removed. By using the iframe mode on Livestorm , you can replace our replay video source to fetch a recording from another platform. The iframe can be an embed widget from YouTube, Wistia, Twitch, etc. In this example, we use a pre-recorded demo (recorded using Screenflow) hosted on Wistia. 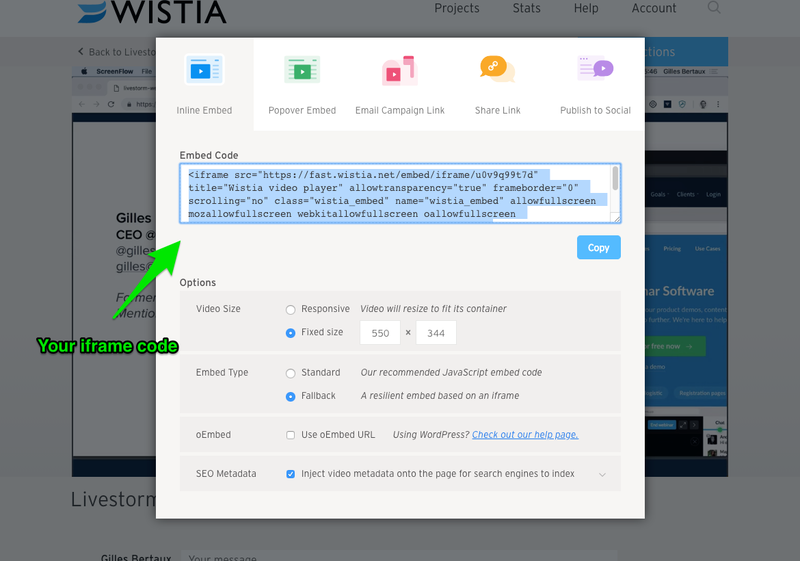 We went with Wistia because they provide additional analytics on the views and advanced controls on the iframe mode. But you can do the same with YouTube. To begin, grab the iframe code of your video. You can add the autoplay parameter to the iframe so that the video starts when people jump in the webinar room. 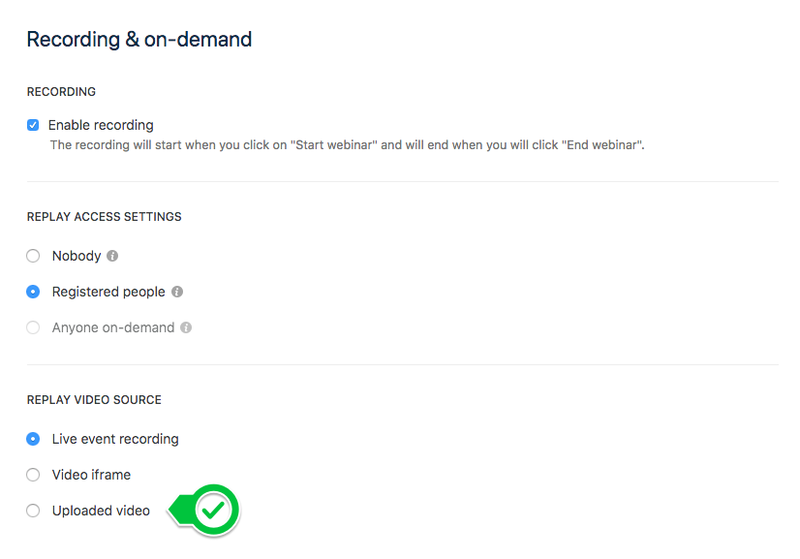 Go to your "Recording & on-demand" settings from your webinar dashboard. Choose " Video iframe" under "Replay video source" and paste your iframe code. In this example we will use a pre-recorded video from Youtube. To begin, grab the iframe code of your video. With Youtube, you have several embed options. By checking or unchecking these options, the code will be updated to include these settings. Here we've unchecked the option to "show suggested videos when the video finishes," which adds the text underlined in green to the code. Select your embed options and copy the iframe code. You can add the autoplay parameter to the iframe so that the video starts when people jump in the webinar room. With Youtube, you need to add a parameter to mute the video as well in order for the video to autoplay. As a result of browser updates, it's not possible to autoplay videos in certain cases. If you don't want to use the recording provided by our system, you can also upload your own custom MP4 file as replay. We accept all MP4 files under 500MB. This way we'll replace the default replay with your custom video in our system. 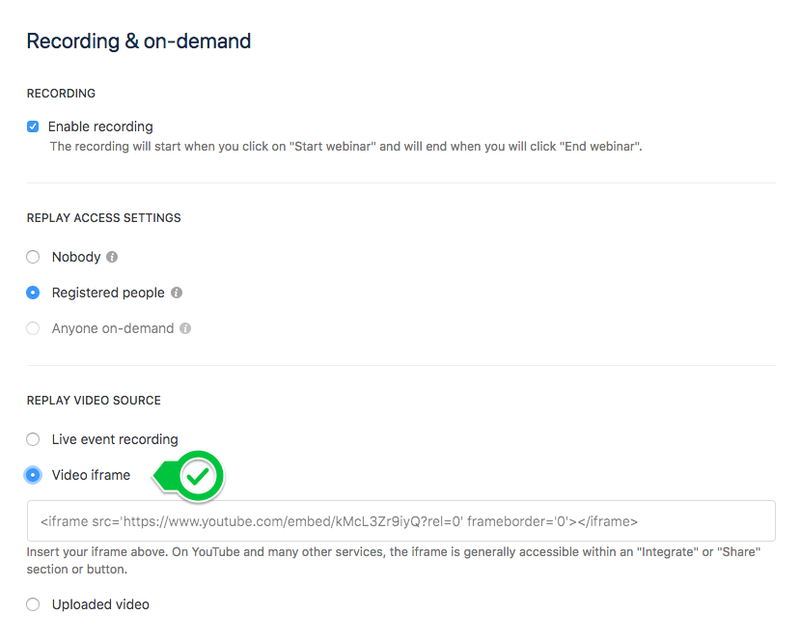 If you'd like your custom replay to show up right after you end your webinar, make sure to upload in your webinar settings before you start your webinar. Otherwise, your attendees will have to refresh their page to see the uploaded file. All you need to do is click " Uploaded video" under "Replay video source" and choose the file from your computer. If you'd like to change the file, all you have to do is hover your mouse over it and click "Change".